From our double-load washer-extractors and dryers to our massive eight-load machines, you’ll get the job done fast. Save money by signing up for a free County Seat Laundry Savings Card. 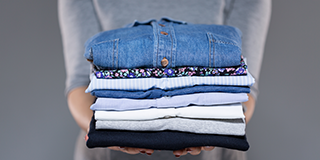 We’ll wash, dry and fold or hang your laundry so you don’t have to. It’s fast, professional and done. 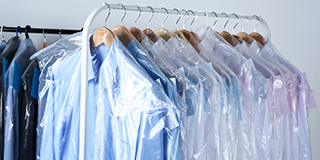 Drop off and pick up your dry cleaning at County Seat Laundry and save yourself a trip to the cleaners. So nice and clean; owners there to answer any questions (very friendly and nice). LOVE that I can just swipe my debit card!! Excellent facility, convenient layout, efficient equipment and friendly, onsite staff to help out. Made my giant once-yearly down duvet, pillows and wool mattress pad laundering a snap. I do a ton of laundry every week and the Savings Card saves me money. I love that I can reload the card at the washer or dryer with my debit card and put on only as much as I need. This service is a Godsend. I work a lot of extra hours and sometimes get behind on the laundry. I recently brought in three weeks’ worth of clothes, sheets and towels and dropped them off on my way to work and picked them up on the way back. It saved me a lot of time I just don’t have. I don’t need to drive to La Crosse anymore to get my dry cleaning done. This service saves me hours. Thank you.